Dororo was published in English by Vertical Inc. in 3 volumes from April 29 to August 26, 2008 and again in a complete omnibus on March 20, 2012. Dororo is simply put a masterpiece. A manga from the late 60s that aged very well and is probably the darkest of Tezuka's works. It's violent, cruel, and does not spare most of its characters from certain and permanent death. Oddly enough, something rare of seeing even today. The story is about a swordsman, Hyakkimaru, who has born lacking forty-eight body parts because of a curse caused by his father. It's a lone wolf journey sort of story, where our protagonist eventually finds a funny, yet complex fellow, Dororo, who happens to have a very detailed backstory that holds great importance for the plot's progression. Tezuka is a very straightforward writer and his stories are usually, regardless of their quality, easy to read and having an idea of what's going on. Its themes are easy to understand, the characters don't occupy more time than necessary, the conversations are light without ruining the mood and even though the tension is little to nonexistent, it's easy getting engaged and curious about how things are going to turn out. Themes are simple but extremely well executed without the feeling that Tezuka's trying to force them down through our throats. Poverty, for example, is everywhere. We know that, don't we? One thing that, however, most leaders and governments around the world aren't willing to let citizens be aware of is the fact poverty and violence are strongly connected. There's a panel in the manga where Dororo states that two things are necessary in this world: money and a sword. A child, whose innocent childhood was stolen by generalized violence, matures fast and grows up to become one of the several 'bad guys' the reader can see throughout the entire manga. Exploitation giving rise to an overall discontentment of the population, violence used as a weapon by the nobility, ruining the life of commoners and their opportunities, and characters losing grasp of their dreams and happiness due to being surrounded by such a grim atmosphere. Hell can freeze before Tezuka supports War in any way possible. However, in spite of given important matters, the characters do not serve only as receptacles of themes or ideas, but rather are individuals living miserably in a ruthless place, struggling to find their path and pursuing meaning wherever it is due. The protagonist is violent but doesn't want to fight. He's striving for something more meaningful, he's trying to reach his wholeness, though willing to shed lots of blood to achieve it. He develops, but not as much his cute companion Dororo who's been through a lot and which we get along with over time. He always tries to push things to their comical side, always hiding his nasty past behind a big smile and childlike innocence. I must confess, I adore his character and you will surely get surprised by how captivating he is in the long run. I must, however, denote some problems. I appreciate the focus of Tezuka and his willingness to make so much of little time and space, but it's undeniable the fact he doesn't explore a lot of what he presents and it piles up to the point where one cannot forgive but ask: "What about that?". At the same time I applaud the author's astonishing ability to create interesting side characters, I also pinpoint the fact most of them fall flat in the long-term as their arcs are too short and leaving a lot to be desired. Examples being two nihilistic characters they find (a possessed swordsman and a kid with suicide tendencies), Midoro's relationship with her son and one that particularly bugged me so much: the woman-spirit who's found by Dororo and that shares a lot of sympathy towards him. Lots of interesting interactions, possibly leading to an equally interesting background, backstory, development, etc. Unfortunately, we will never get any of that. The artstyle is Tezuka style. You know it, you love it. It's simple, straightforward and extremely easy reading. Some visual jokes here and there involving paneling, the paneling itself being commendable for its organization and interesting presentation, always following a pattern of three to four panels in scenes where scenarios are being highlighted, never overloading the reader with needless visuals. The mood is clearly soft, so are images in general. This manga is a hidden gem and like many other Tezuka's works, it is worth the time of anyone. It's accessible, fun and poignant. It has a purpose, a story to tell, characters to flesh out, points to make, themes to convey, enjoyment to provide, so on and so forth. I wish you good leisure while reading this. Many know Osamu Tezuka as the author of Astro Boy and a few more works and that's it. As logic, that's ignorance. Dororo is one of the most famous works of the author and at the same time, one of the darkest. In English, this work was published by Vertical in three volumes, including a new cover design showing human flesh in some panels of manga, showing how dark it is inside. Dororo tells the tale of a samurai lord (Hyakkimaru) that has bartered away his newborn son's organs to forty-eight demons in exchange for dominance on the battlefield. Yet, the abandoned infant survives thanks to a medicine man who equips him with primitive prosthetics—lethal ones with which the wronged son will use to hunt down the multitude of demons to reclaim his body one piece at a time, before confronting his father. On his journeys, the young hero encounters an orphan (Dororo) who claims to be the greatest thief in Japan. When reading, the art gives you that 60's look: well-designed monsters, humans are impressive and all the action is very detailed being an old work, making it an interesting atmosphere as a whole. I find the characters of this manga very alike other works of the author but that's not really a bad thing, the reader must comprehend that when reading. As for Dororo, it is really a fantastic character, bringing all readers to curiosity when they change to the next page continuously until they finish reading. Dororo can be a cute character, a really badass or both, it depends on the person and what's that person thinks of the characters itself. It's just a shame that Hyakkimaru was not as a deep character as Dororo but that's not the main concern when reading, despite the fact that Hyakkimaru’s father made a pact with 48 demons that he’d offer each demon a part of the yet-to-be-born Hyakkimaru’s body in exchange for the fulfillment of his wish. To conclude, Dororo it's a very paced, complex yet fun story, full of action and twisted plot points to keep the reader interested in this kind of manga. Dororo is still episodic, so that's a plus. I know people won't give a chance to this kind of stories but that's even better for those who like it because these people feel more comfortable, within their own taste and that's a good thing. I really believe that Dororo is worth investing even though there's a lot samurai vs monster/youkai manga out there. Again, I'm not saying those people are forced to like it but they should at least try a classic version of that specific stereotype. If you are European, you can compare this Dororo to Hattori-kun from the "Ninja Hattori-kun" anime, since both of them are called ninjas/assassins (even though Hattori-kun is more turned to comedy). Personal Note: One of my favorite manga since the creation of manga itself. At times when the fad is to read action/mecha/romance packed series, coming across a manga such as Dororo is a wonderful experience indeed. Most of us love Tezuka’s works but barely a few might have heard and bothered to read such an unknown manga. Compiled up in 4 volumes and about 870 pages (which are actually 3 volumes with a total of about 850 pages in the translated version) is the story of a Samurai and a chibi samurai hater in the Sengoku period. 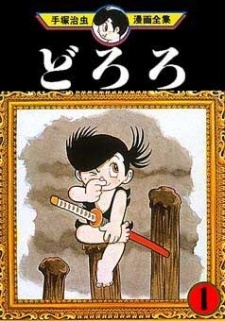 The main protagonist, despite the fact that the manga title points to the orphan Dororo, seems to be Hyakkimaru. In order to conquer the country, Hyakkimaru’s father made a pact with 48 demons that he’d offer each demon a part of the yet-to-be born Hyakkimaru’s body in exchange for the fulfillment of his wish(doesn’t sound so clichéd, eh?). As a result, Hyakkimaru is born with 48 body parts and internal organs missing. His mother, when she realizes what has befallen his son, puts him in a basket and releases it in a river. The formless infant is then found by Dr. Honda who believes he’ll survive and raises him. As he grows, Hyakkimaru learns to move about by crawling on his stomach and even learns to speak from his stomach. But soon he is haunted by weird demons looking for his soul and Dr. Honda decides he must leave. Dr. gives him prosthetic limbs inside each of which he attaches a separate weapon such as swords in his arms and a skin-burning spay in one of his limbs. He then sets off to slay the 48 demons and finds company of the young thief Dororo(who is later revealed to be a girl even though she herself does not believes it). Together they help villagers ger rid of demons and gain Hyakkimaru’s organs one by one. The overall manga is a very good one considering the time it was made in; however a major drawback in it is the way it ends. We never clearly get to know what exactly happened except a line that mentions “Where Hyakkimaru went from there, no one knows. It is said that fifty years hence the flames of war burned down the hall of hell that housed the 48 sculptures.” And Dororo only calls out to him from a distance..But Hyakkimaru never turns back. I think that I would have liked to see a few more pages describing what happens in the near future but the manga is good as it is maybe. Dororo is one of Tezuka Osamu's darker works, and I'm honestly not sure what the author was aiming for here. Anyway, this was released by Vertical in 3 separate volumes, instead of 4. Vertical's release features a new cover design, which is possibly the worst cover design I've ever seen. Describe the cover? Imagine taking random panels of manga and pasting it onto some human flesh. Cool,right? No, not at all. It's really fun and fast paced. Dororo is full of action and cool monsters. Dororo is episodic, ignoring some slight continuation. But these words of praise on apply to the first 2 volumes, while the final volume is a poorly written mess. The 3rd volume introduces possible new allies, only to kill them off at the last possible moment, because writing in a new character is hard. It's just really incomplete as a whole. It was fun, certainly not worth the money, though. Plenty of better samurai vs youkai/monster stuff out there.